We had so much fun working on this brand strategy + brand identity project and we're so excited we can finally share all the work we've done! Lyda is a so smart and ambitious, it was so much fun getting to help her take this new step in her entrepreneurial journey. We worked with Lyda to build the strategic foundation of her brand - diving deeper into what she does, who she serves, and what makes her unique. We then took that foundation and designed a brand identity with brand assets to match her message and help her attract her ideal clients. When Lyda got in touch with us, she had big goals, but was having a bit of trouble putting together all of the building blocks that create a brand. She had big ideas that were unique, but were feeling just a little disjointed. She started her business journey as a holistic nutritionist through her health + nutrition blog, The Primal Rabbit. But after a year of pursuing this business, she discovered her passion lied in using her knowledge and skills to help business owners achieve better work life balance not only for themselves, but their employees.. Her desire to help small business owners with employees create a positive company culture didn't fit with the Primal Rabbit's brand. She knew it needed a new name + home on the web to pursue this idea. We encouraged her to use her own name, and thus the Lyda B brand was born. A: I loved your style and overall look of your website, including people you worked with. I found you both to be extremely helpful with providing a very clear outline of the proposal and answering my questions. All very prompt and quick. A: Tough, very tough but I also really knew I needed it BADLY. I have terrible shiny object syndrome and my attempt to rebrand myself was failing miserably. It looked unprofessional and had no solid grounding. The first thing we did was work on the strategy behind the brand. We sent her our brand strategy worksheets to explore what made her unique and who her audience was. As a team, we were able to clarify her unique position in the marketplace and get specific on both a primary and secondary audience for her brand. By focusing on strategy before design, the foundation of Lyda's brand became clear. After delivering her Brand Strategy Blueprint, we designed a brand identity that would match her messaging and attract her ideal audience. In our visual exploration, we always ask if there are any images or icons that really stand out to them. Lyda's response included a bee. She said she had always envisioned herself a lot like a bee, constantly buzzing around to get things done. This really stood out to us because we felt like the worker bee was a strong symbol for all who work in small business. 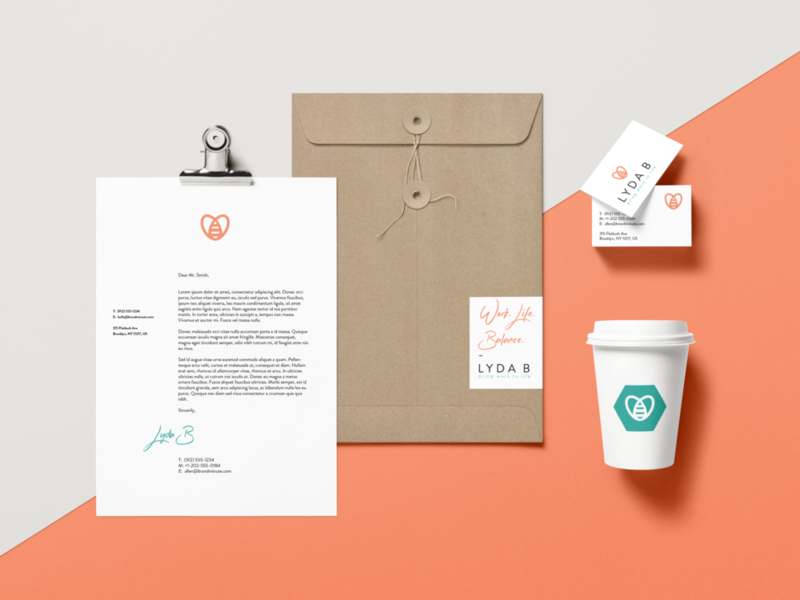 And since Lyda's all about helping bosses and their people build a better work-life balance - we landed on the idea of combining the bee with a heart to show that work and life can coexist. A: Trying to explain myself - often, I felt like I was just spitting words on a page. I like how you structured it together and made sense of it. It was exactly what i needed. I also found some of the questions hard to answer and sometimes it was difficult to explain why i did/didn't like something. A: Surprised how easy and smooth it all went and how much it helped put my mind at ease. We've built a brand that we're all incredibly proud of! Not only visually. The Lyda B brand is built on a solid foundation that should give clear direction as the business grows. We accomplished Lyda's goals of creating a message that was new to the business coaching world and will help her stand out to potential clients. A: It helped create consistency, a professional feel and overall structured design. I now have a solid template to refer to and use in all my documentation and processes, in every colour. I know what fonts to use and when and I have a solid tag line to work from. THANK YOU. Never hesitate to reach out - if you think you're ready to work with us get a jump start here. Still not sure? Feel free to reach out to us to ask more or just to say hello.